Cardiac output is defined as stroke volume multiplied by heart rate. This is therefore affected by stroke volume and sympathetic/parasympathetic output to the heart. Stroke volume is affected by how much the heart fills in diastole and how easy it is for blood to be expelled in systole. This article shall consider components of stroke volume, Starling’s law, its regulation and clinical conditions that may occur when it is inadequate to meet the body’s needs. Stroke volume is defined as the difference between the volumes of blood in the heart at the end of diastole (maximum filling) and the volume remaining in the heart at the end of systole- i.e. the volume of blood that is expelled with each beat. Control of stroke volume is therefore directly related to the amount the heart fills and the heart’s ability to pump blood into the arteries. Central venous pressure increases if the volume of blood in the venous system increases, this increases the diastolic filling pressure therefore increases the volume of blood that is available to be pumped out. This is explained by Starling’s law of the heart. 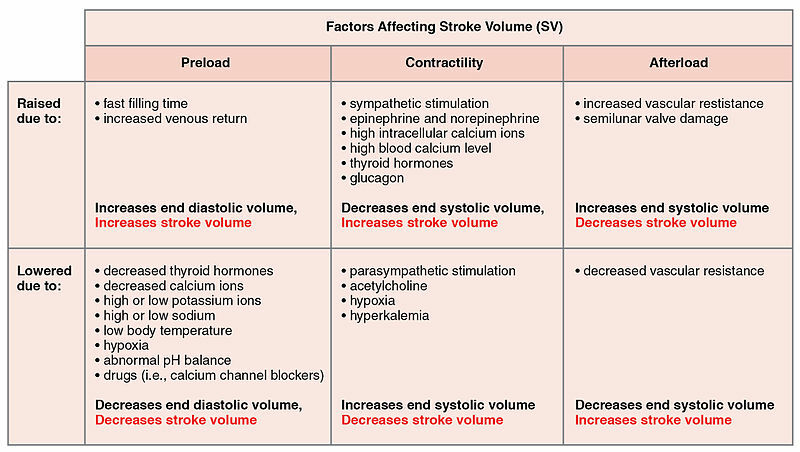 Fig 1 – Table to show factors affecting stroke volume. Starling’s law states that the more the heart fills the harder it will contract therefore the bigger the stroke volume (up to a point). This is based on the principle that the force developed in a muscle fibre depends on the degree to which the fibre is stretched. Therefore a rise in central venous pressure will result in an increased stroke volume automatically. The Starling curve relates stroke volume to venous pressure and the slope defines the contractility of the ventricles. The preload of the heart is the volume of venous blood that stretches the resting cardiac muscle. The filling of the left ventricle during ventricular diastole results in the end-diastolic volume. Fig 2 – Frank-Starling curve showing the relationship between end diastolic pressure and stroke volume. Contractility is also controlled by the autonomic nervous system. It has both sympathetic and parasympathetic (vagal) innervation that act to increase or decrease heart rate and contractility. Sympathetic stimulation has a positive inotropic effect (increases contractility) acting via beta-1 adrenoceptors. 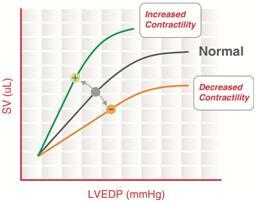 Vagal stimulation has a negative inotropic effect (decreases contractility) acting via muscarinic (M2) receptors. Autonomic control is regulated by the medulla oblongata in the brainstem which receives sensory input from peripheral and central baroreceptors and chemoreceptors located in the carotid sinus, arch of the aorta and carotid body. Total peripheral resistance increases with vasoconstriction increasing arterial blood pressure making it harder for the heart to expel blood into the arteries thus reducing stroke volume. Shock is defined as an acute condition where there is inadequate blood flow throughout the body. This can occur due to a fall in cardiac output caused by pump failure (cardiogenic shock), the inability of the pump to fill (mechanical shock) or loss of blood volume (hypovolemic shock), or an uncontrollable fall in total peripheral resistance due to excessive vasodilation (distributive shock). Cardiogenic Shock – In this case the central venous pressure (CVP) may be normal or raised. This means that the heart fills but it fails to pump effectively, causing a dramatic drop in arterial blood pressure. This means that tissues are poorly perfused, which in the case of coronary arteries exacerbates the problem. Mechanical Shock – In the case of cardiac tamponade blood or fluid builds up in the pericardial space which restricts the filling of the heart. This results in a high central venous pressure and a low arterial blood pressure. However there is normal electrical activity as the heart still attempts to beat. Toxic Shock – This results from endotoxins released from circulating bacteria during infection. These cause vasodilation and a massive drop in total peripheral resistance. This drop in arterial pressure leads to impaired perfusion of vital organs. Typical symptoms include tachycardia, rapid and shallow breathing and reduced blood pressure, although they may vary slightly depending on the cause. Treatment is typically supportive and includes fluid resuscitation and treatment of any cause such as an infection in toxic shock. Which of the following will cause an increase in stroke volume? Which of the following does not affect contractility? Which of these is not a type of shock? Which of these is not a sign of shock?